Raipur Multi Speciality Dental Hoispital - Nursing Homes / Clinics / Hospitals of tooth jewellery service, restorative dentistry - crown and bridge- dental crown & restorative dentistry - crown and bridge- bridges in Raipur, Rajasthan. Tooth Jewellery is much in demand these days in cosmetic dentistry. Most are making this style statement not only to surprise friends with a sparkling crystal glass design, or something in gold with a twinkle of ruby or diamond, but also add zing in life. These tiny little designs are great fun, and because there’s no drilling involved, they won’t harm your teeth. If you want to make an oral fashion statement, there are safe ways. One is to use “Twinkles” – decorative appliqués that are bonded to teeth by the dentist, in the same way as orthodontic brackets. The procedure is very simple and usually takes about 10 to 15 minutes. They can be left in place for years if desired, but are removable, and do not damage the tooth. The Jewellery is just cemented onto your tooth, the design can be changed several times if you want to change your smile, or even go back to your original smile. Temporary , Can be removed any time One desires. 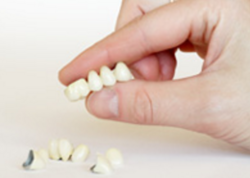 Crowns are used to cover damaged, cracked, chipped teeth, or to generally restore teeth. 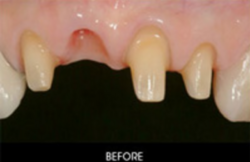 When cemented into place, they fully cup over the portion of a tooth which lies at and above the gum line. 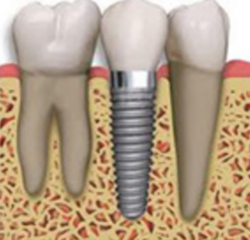 A dental implant is a "root" device, usually made of titanium, used in dentistry to support restorations that resemble a tooth or group of teeth to replace missing teeth." Any infection of the vital teeth supporting gum tissue is known by the terms Periodontitis, commonly called Periodontal Disease. This infection can originate from a simple gum infection known as Gingivitis and when left untreated can develop into a complicated disease. Periodontitis may lead to loss of one or several teeth to even increasing the risk of heart attacks among several others. The root cause behind the infection of the soft gum tissue is that Bacterium and other pathogenic agents form plaque which then turns into the more solid tartar that eventually causes the infection. The ideal way to prevent Periodontitis is by maintaining a good oral hygiene by regularly brushing and flossing. Regular check ups by your dental practitioner can help you identify plaques at an early stage. Gum infection can itself be slowed or even stopped depending on one’s level of dental hygiene. 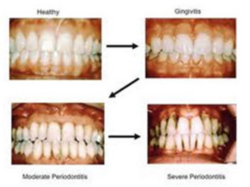 Gum problems are best resolved by a Periodontist who is a dental practitioner with a specialization in Periodontitis. "Pediatric dentistry is the branch of dental medicine that focuses on preventive and corrective dental care and oral health for children. A pediatric dentist attends primarily to infants and young children, and also adolescents." 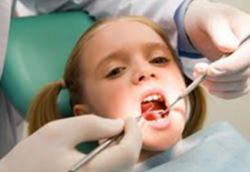 A pediatric dentist is the person who attends to childrens dental health problems. A pediatric specialist would have undergone formal training from an academy of pediatric dentistry and knows the special care that needs to be undertaken while attending to children and their medical issues. Dealing with children follows a different set of rules than when dealing with adolescents or adults, and a good pediatric dentist will know how to relate to the children, and get his message across in a fun and educational way. At the pediatric dentists office, a lot more things other than dental cleaning are carried out. For instance, a dentist pediatric, provides counsel for parents and advises them on how to get their children to get rid of their bad habits, such as sucking the thumb. Though this might only be a childhood habit, it has the potential of creating quite a few problems such as misaligned teeth, improper growth of teeth, premature falling of teeth and so on. A pediatric dentist also attends to chipped teeth and similar dental problems encountered when dealing with children. Similarly, carrying out fluoride treatments to clean the children’s teeth is quite a routine procedure in any pediatric dental practise nowadays. Not only do pediatric dentists offer sound support for problems like dental cavities and gum diseases, they also offer credible advice to parents based on known and tested methods in children pediatric dentistry to ensure that these kinds of dentals problems can be prevented. A pediatric dentist also offers comprehensive advice about nutrition and the kinds of food to be avoided in children pediatric dentistry. This helps parents understand what is best for their kids and follow accordingly. When a dentist or endodontist tells the need for root canal treatment, the term “root canal” itself may send shivers down spines due to preconceived notions that root canal treatment is filled with pain and discomfort which are nothing more than outdated myths . In fact, root canal treatment doesn't cause pain but actually relieves it. Advances have made the treatment a virtually pain-free experience, many times accomplished in a single visit. so, don’t worry… you're not alone. Millions of teeth are treated and saved each year with root canal, or endodontic treatment. So let's start by dispelling a common myth: Root canal treatment doesn't cause pain — it relieves it! One can gain more information by going through this step-by-step walk-through of root canal treatment. Zirconium also called Zirconia (Cercon) is rapidly becoming the material of choice for dental crowns. It is a very strong material able to withstand the wear and tear of every day use. Aesthetically, it is translucent very similar to a natural tooth, reflecting light in much the same way.